Today I'm featuring a newish blogger, Rob of Carews in Surburbia - Rob is an absolutely awesome blogger who blogs about being a parent and I strongly recommend checking him out. Even though he likes coffee. I’m fairly new to the blogging scene and when Mike contacted me about writing a guest post, on The Blog of Thog, I was extremely flattered. I had caught one or two of his previous posts and appreciated the irony and wit in the writing. Guest blog writing services will be performed by the undersigned Rob Carew, proprietor and partial owner of www.carewsinsuburbia.com. Said blog writing services will be limited to one post as per the “Possible Suckage Clause” and will be subject to Thog review and approval prior to posting. Rewrites will be limited to no greater than the number of digits in Pi. Payment for said blog writing services will be capped at $0.00 Canadian which converts to approximately 0 British pounds. The deadline to submit said blog post will be sometime in the near future at the convenience of the above mentioned blogger, one Rob Carew. Content should focus on said blogger’s preferred area(s) of expertise or, at the very least contain words and punctuation. Complete sentences, proper grammar and coherence are optional. Now that I had my marching orders, ideas flowed from me like a mountain river during the spring melt. I was going to write a soul searching, heart-warming, tears streaming down your face, sobbing at the beauty of my majestic prose while you learn an important life lesson blog post. This was going to be the epic guest post to end all guest posts: Funny and witty, but with a touch of sincerity. Readers would not only applaud Mike for discovering the next great blogger, but also race over to my own blog and become devoted followers. However, as a consummate non-professional blogger, I understood the importance of doing your research and gaining a deep, almost psychic-like connection with the audience. I know my own audience and understand my areas of expertise, but needed to get into the mind of The Blog of Thog. What makes the readers of this blog tick and how can I connect, while staying true to my own blogging roots? Imagine my shock when I came across a series of archived posts beginning In October 2014 referencing the now legendary coffee vs tea debates. Worse, from all appearances The Blog of Thog was firmly entrenched in the tea camp. How could I write a guest post on a blog connected to such blasphemy? Would I be forsaking everything that I hold dear? As one of the last remaining Coffee Commandos and a regular tweeter ( twitter handle @rob_carew) about all things right in the coffee loving world, how could I in good conscience write this guest post? I was torn. Mike’s post on http://thoggy.blogspot.ca/2015/07/a-night-watching-shopping-channels.html (A Night Watching Shopping Channels) was pure gold. It spoke to me as a father who has likely watched every late night infomercial hundreds of times while settling my children. After what must have been seconds of quiet, contemplative reflection and at least three re-reads of that imaginary contract, I realized that as blogger, it’s important to accept that others may not always agree with you. Blogging is about getting your message out and expressing an opinion. Even if I don’t agree with said opinion, that doesn’t necessarily make it wrong and I made a commitment that needed to be honoured. Being a father is hard work. Being a father who works full time is even harder. 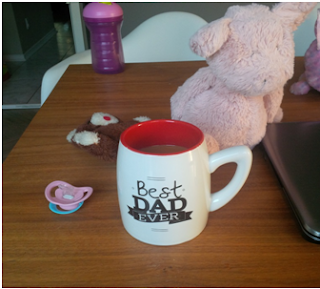 Being a father who works full time and writes a blog means lots of late nights. Late nights and early mornings leave me feeling drained and without my morning coffee, I don’t know how I would get through the day. While I’m doubtful and somewhat skeptical, as someone who embraces change, I can accept that tea and even soft drinks might also be useful for tired, working, blog writing individuals. Everyone, regardless of beverage preference, should be welcomed with open arms because, at the end of the day, we are all just individuals trying to get by in a crazy world. Fantastic Post, Mr Carew. If you want a bit of advice from a guy with a little blogging experience, write the "epic," "tears streaming down your face" for your won blog. I think Mike Raven is a fantastic guy, and one of my favorite bloggers, but when you write that bring it on home, big guy. Thanks for the nice blog. It was useful for me. I'm happy I found this blog. Thank you for sharing with us,I too always learn something new from your post.